This quality wedding guest book is for those that like all the frills and bling. 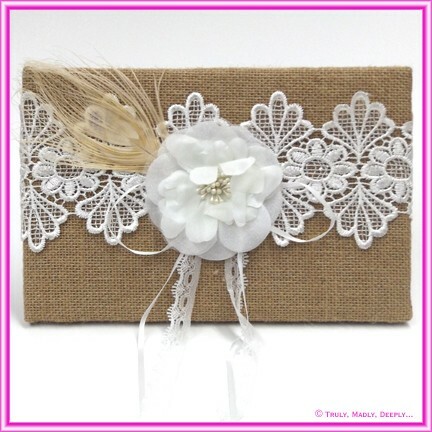 It is covered in quality hessian burlap material and decorated with white floral lace and to finish it off beautifully, it has been given a large flower that also has a brooch in the middle. It is an absolute must have for the couple that are having a vintage wedding or even a garden Wedding. Such a beautiful book is such a nice way to preserve your wedding memories. Matching pen, ring pillow and flower basket are also available in this collection. See below for details.